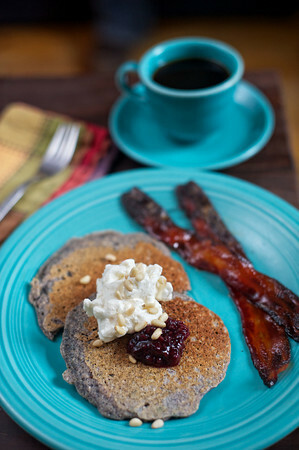 Two of my favorite breakfast treats in Albuquerque are the blue corn pancakes from Sophia's Place, and the red chile-honey glazed bacon from Gold Street Caffe. When you make them at home, you can have both together! Add a few pinon nuts and a dab of local raspberry jam, and this is a spectacular breakfast. I got some great blue cornmeal from the Corrales Chile Company at the farmers' market a few weeks ago, but you can often find it in local grocery stores. The pancakes are adapted from a Cook's Illustrated recipe for multigrain pancakes made with ground muesli, and I just substituted the blue cornmeal. Whisk lemon juice and milk together and set aside to thicken. Mix cornmeal, flours, sugar, baking powder, baking soda and salt. Whisk together milk, eggs and melted butter. Gently whisk the milk mixture into the cornmeal mixture, until just combined. Heat a large cast iron skillet over medium-low flame for 5 minutes, letting the batter rest. Brush the skillet with 1 teaspoon oil or butter. To check whether the skillet is ready, add 1 Tbs batter to the pan and time it for 1 minute - if it is golden brown, the pan is ready. Adjust the heat accordingly. Pour in about 1/4 cup of batter for each pancake. Quickly sprinkle a few pine nuts onto each cake. Cook until the top of each pancake is evenly covered with bubbles and the edges are looking solid, about 2-3 minutes. Flip them over, and cook the other side until golden, about 2 minutes longer. Brush another teaspoon of oil on the pan before each batch. Preheat oven to 400 F. Line a baking sheet with foil. Place bacon strips on a rack over baking sheet (this lets the fat drip off, so you don't have to drain on paper towels, because the glaze will stick to the paper towels). Mix honey, water and red chile thoroughly in a small dish. Brush with glaze and bake 5 minutes. Brush with more glaze and bake 2-5 minutes longer, watching carefully to make sure it doesn't burn. Thick-cut bacon takes a bit longer.